Back in February Italian media claimed that a secret report by cardinals investigating the leaks included allegations of corruption and blackmail attempts against gay Vatican clergymen, and on the other hand, favouritism based on gay relationships. 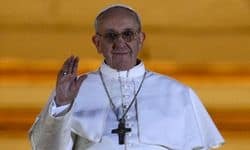 "In the Curia, there are truly some saints, but there is also a current of corruption," the pope is quoted as having said during an audience last week with CLAR (the Latin American and Caribbean Confederation of Religious Men and Women). "There is talk of a 'gay lobby' and it's true, it exists. We have to see what can be done," the 76-year-old pontiff is quoted as saying on the Reflection and Liberation website, which was flagged up by religious news agencies on Tuesday. Vatican spokesman Federico Lombardi told AFP: "It was a private meeting, I have no comment to make."